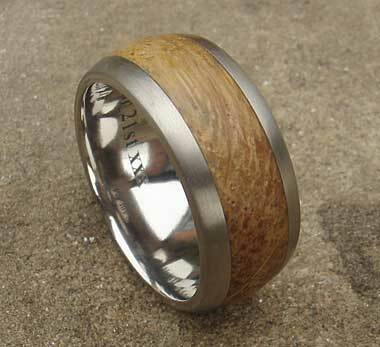 Wooden Inlay Titanium Wedding Ring : LOVE2HAVE in the UK! 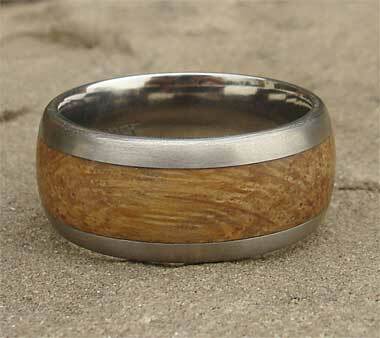 A wide titanium wedding ring with a wooden inlay. 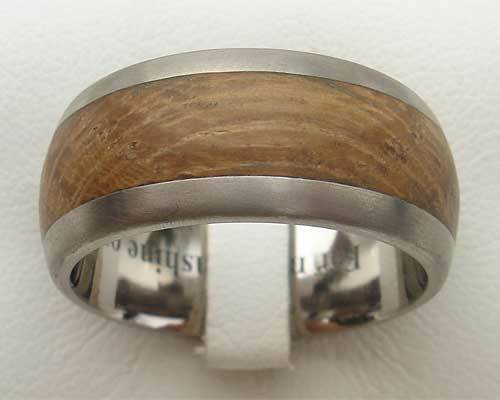 This ring measures 10mm in width and comes inlaid with oak that measures 6mm wide. We have chosen oak as it is known to be a very durable type of wood, and therefore compliments the strength of titanium. The ring has a rounded profile, and the titanium has a satin matte finish. The fitting of it is a comfort one, meaning it is slightly curved and glides nicely onto the finger. We sell other widths of this ring also but list this one at 10mm, a nice width for a man's finger. We mention on our site how titanium makes a brilliant choice for a wedding ring to inlay into as it is very strong and protects the inlaid material from too much wear and tear. Not only does this work with gold and silver but for wood also, which is why we are featuring these type of titanium wedding rings. Profile(s) Available: Rounded comfort fit.